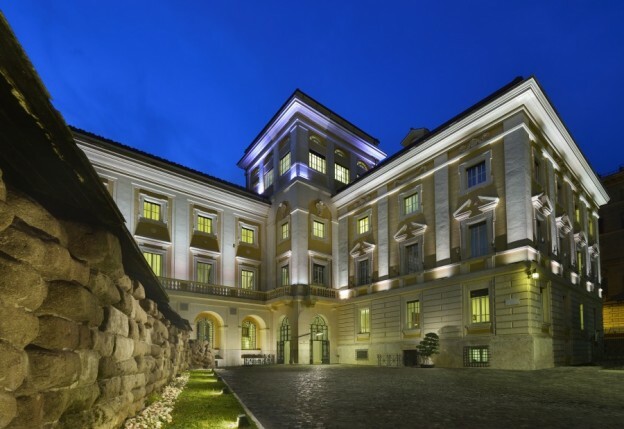 Originally a pair of remarkable 19th-century family palaces literally abutting the ancient Diocletian Baths, the palaces later became part of the City’s transport head office supporting the now busy Termini neighbourhood; Rome’s main railway terminus. Fortunately, much of the ornate interiors were retained, providing the impetus for the conjoined twins to be transformed into a luxury 5-star hotel in 2013. 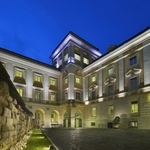 In a genius move, the owners somehow managed to ensure the prized features of the original palaces comfortably held hands with some extraordinary contemporary additions; a feat not lost on major hotel group Radisson who, fast forwarding to today, made it Italy’s first recipient of the prestigious Radisson Collection brand. Hence the official red carpet celebrations tonight. Personally, I think its new Radisson Collection status is very well deserved. 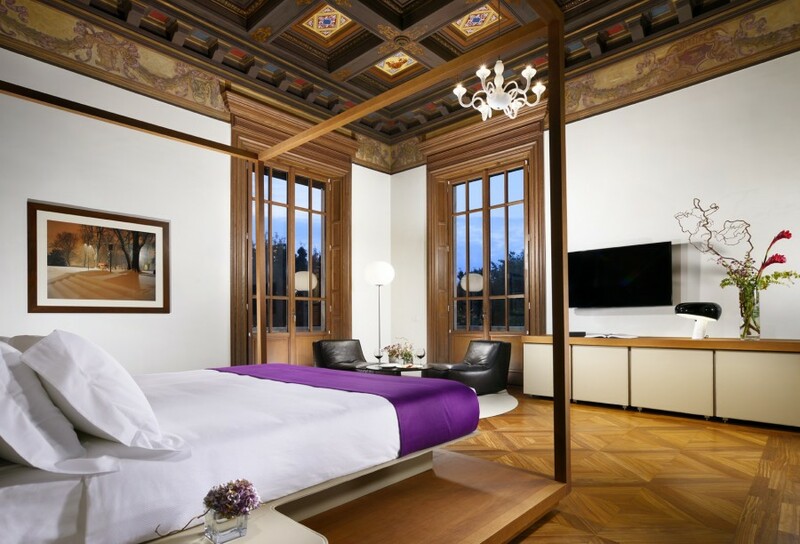 Not only is this a hotel of remarkable interior design but, under General Manager Marco Luzietti’s watchful eye, the guest service is to be applauded. Clearly, the hotel’s close neighbours the Diocletian Baths and Servian wall (the wall that first encased ancient Rome) provide the inspiration behind much of the interior; huge stone building blocks decorate the lobby space and in Senses, the main restaurant, eight floor-to-ceiling Romanesque pillars form a guard of honour around an inspired stone table fountain. Watching individual lasers of water cascade down from the ceiling really is a centrepiece worthy of dominating any dinner conversation. 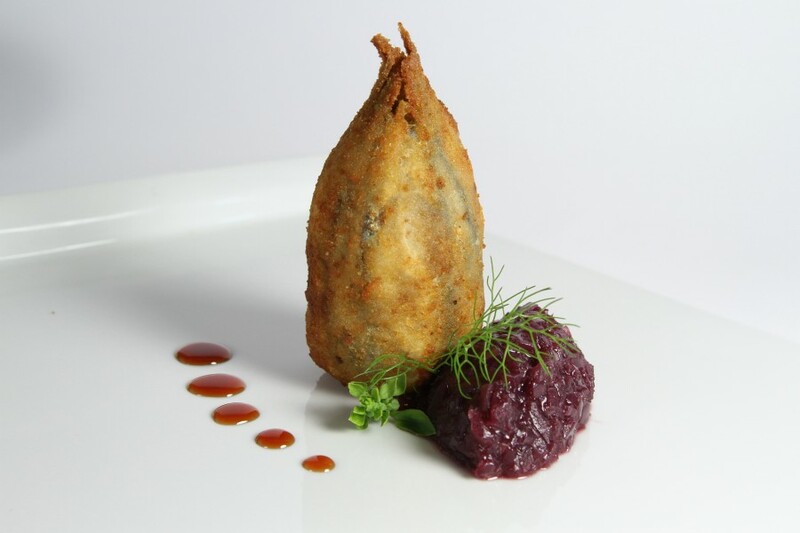 Talking of dinner, Executive Chef Simone Strano is something of a culinary magician. His personal book of tasty spells pays homage to his Sicilian roots, a six-course tasting menu option taking pride of place although alternatively, there are many a la carte decisions to be made. 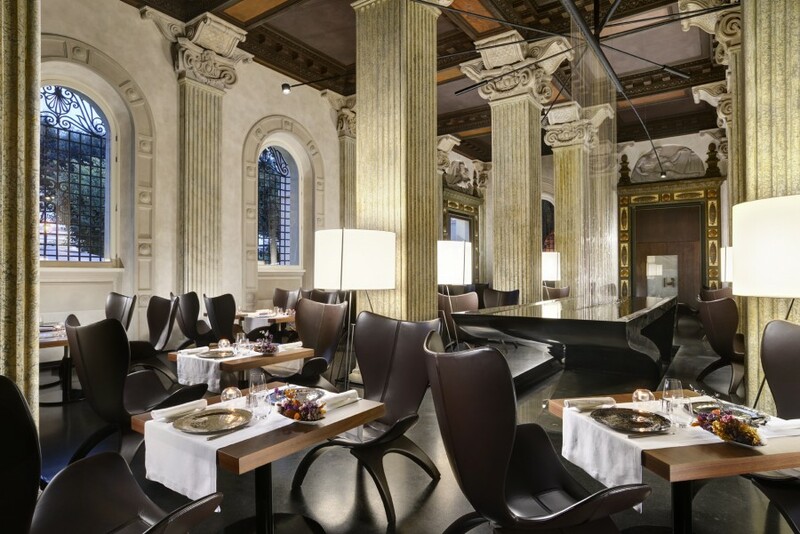 His fish choices are something of a speciality however, the arancino di alici, in particular, is a memorable starter together with a melt in your mouth veal cheek and orange main. Upstairs, my Premium Collection room is a delightful combination of classic and contemporary; a spacious lounge area dominated by a glass table and flat screen TV, a king bed awaits in the bedroom area with yet another flat screen to play with. The free mobile phone is a pleasant surprise; I find it quietly charging next to the bed and I get to use it to make calls and get online all over Rome for the duration of my stay. It’s a free service for all guests to use, and it’s a genius idea. The bathroom contains a bath that looks as though it’s made of stone, perhaps another nod to ancient Rome and a rainforest shower room that doubles as a state of the art private hammam. 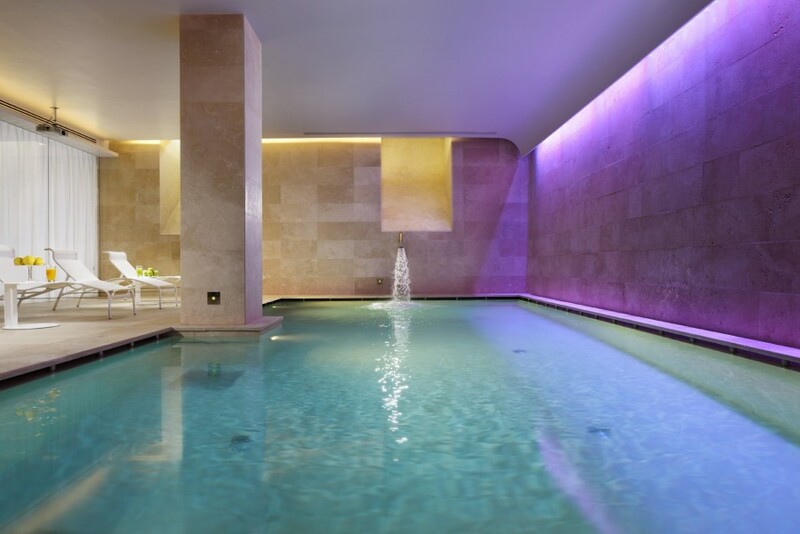 Speaking of hammams, the basement spa is a world of wonderment where yins and yangs can be balanced in harmony through a multitude of treatments from resident therapists. My candlelit massage banishes the stresses of my pounding Rome’s cobbled streets. Even better, the post-massage herbal tea and skewered fresh fruit delivered to me as I lay on a poolside bed make me feel like a pampered Roman emperor. I tune out in the sauna, steam and salt cabins as I contemplate life spending my days dressed in a Toga. The Termini neighbourhood, unlike many other city railway areas, has benefited greatly from gentrification and, for me, is an ideal place to be based in Rome. It’s away from the crowded centre yet just a short walk to all the major city sights. And let’s not forget, as the station’s within touching distance, you can take the Metro instead if don’t fancy walking. As I stroll back in after admiring the facade projection show, I spot the new nameplate shining on the entrance. Palazzo Montemartini Rome. 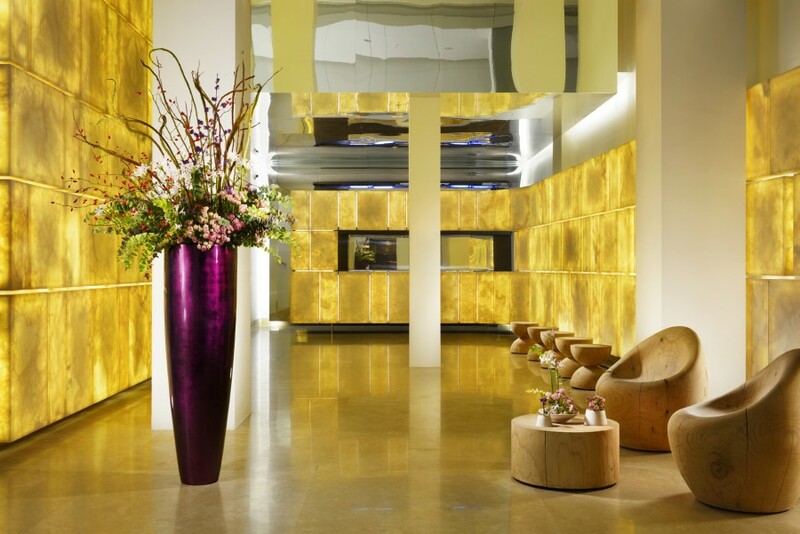 A Radisson Collection Hotel. In true emperor fashion, I give it the imperial thumbs up. 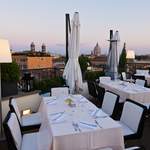 Tell me more about Palazzo Montemartini Rome, A Radisson Collection Hotel. 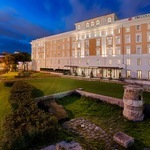 Room rates at Palazzo Montemartini Rome, A Radisson Collection Hotel, start from £165 for a double room on a B&B basis.